Aryton Sonkur signs a one year deal at Galabank ahead of this weekends trip to face Clyde. Sonkur last night put pen to paper as he joined Peter Murphy’s first team squad. The 19 year old midfielder has came from Queens of the South where he was part of last seasons development squad. 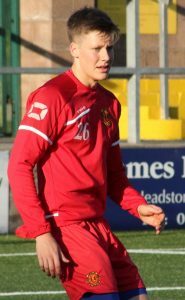 Ayrton also spent time on loan at his home town club Hawick Royal Albert in the Lowland League whilst remaining with the Dumfries U20 side. This now takes the new managers squad number to 17 ahead of his first competitive match at the Broadwood Stadium.